I recently came across an article that left many people upset in its wake. It was written by an Amy Glass and summarized her feelings about marriage and child raising. I haven’t linked to it here, partly because it is nothing but filthy nonsense, and partly because I don’t want to spend hours trying to find it again. 🙂 She described women who choose to marry and have children as ordinary, useless, and lazy. These child bearing women have chosen the easy route that every other woman chooses. They are too afraid to venture out and do their own thing. They have done nothing worthy of recognition or remembrance. I have a few things to say about that. Have we, as a society, so quickly forgotten our own mothers? No matter what our childhood consisted of, someone obviously made sure we were fed and clothed and educated. I have a feeling it is few and far between to find a home truly devoid of any love. This Amy has completely spit in her own mother’s face with her independent declarations. That is not something I would ever want to do. I am very grateful for all that my mother did for me, for all that she is still doing for me. A mother is no small thing. She is anything but lazy, far from useless, and by golly! She ain’t ordinary! So, let’s look at everything a mother is. First of all, what people like Amy always overlook is that without mothers you have, well, no people. You can’t get around it. There is no way to create human life without a mother and a father coming together and contributing their half of the seed. So, when women stop choosing to be mothers, the human race ceases to exist. I suspect that women who declare such strong feelings against motherhood do so partly out of fear and partly because they’ve never experienced it. The moment I felt that first movement in my belly 11 years ago was the moment that I was changed forever. My feelings are no different today. There is a little person developing inside me, completely dependent on every choice I make. The food I eat, the amount of sleep I get, the chair I sit in, all have a direct impact on this little life. That’s a lot of responsibility, perhaps the thing that anti-mother women fear the most. That responsibility doesn’t go away either. As I’m writing this, a tough little 2 year old boy has wandered out of his bed in search of his mommy. The rest of his siblings may still be sleeping, but mommy has the woodstove going to keep them warm. She has breakfast prepared and waiting for them. She ponders how to help them solve their little problems. She marvels at the differences in their personalities. Mommy must be very responsible and ever present, but she is happy to do it. Women who abandon motherhood for “greater things” speak of great accomplishments. They have forged careers, designed skyscrapers, written amazing things. They were not saddled with home life so they were free to spread their wings and fly. (I’d like to know who is doing their laundry and cooking their meals while they spread their wings.) On the flip side, they see us stay at home moms as completely devoid of accomplishment. We are incapable of achieving anything because we are tending to a bunch of whiney brats all day. Well, I can think of something I’ve accomplished. I’ve pushed a baby out, not once but four times. It took all that was within me and divine help from my Creator, but I pushed an eight pound baby out a hole that should be considered too small. And let me tell you something – women who abandon motherhood, there was no one on this planet stronger or more accomplished than I was at that moment. And that was just the beginning. I was designed by my Creator to do this job, and I’m good at it. Every woman who chooses to become a mother was designed for that job. As she puts her heart and soul into that job, she realizes she’s good at it, too. I made milk for those babies. Can those anti-mothers do that? I’d say that’s a pretty hefty accomplishment. I cared for them around the clock until they were old enough to sleep longer. Even then, I put my hand on their chest to make sure they were breathing okay. I put in my long hours “at the office.” Truth be told, I never leave my office. I’m so committed to my choice of work that I never take a break. What the hey! I don’t even get paid for my choice of work and I show up everyday! Speaking of accomplishments, I taught three children how to read, and I did it without a college education. Now, that’s something to be proud of. These women speak of building skyscrapers and leaving behind legacies. I am building lives and my legacy will be seen when my great grandchildren learn about me and realize that they are on this planet because I chose to be a mother. 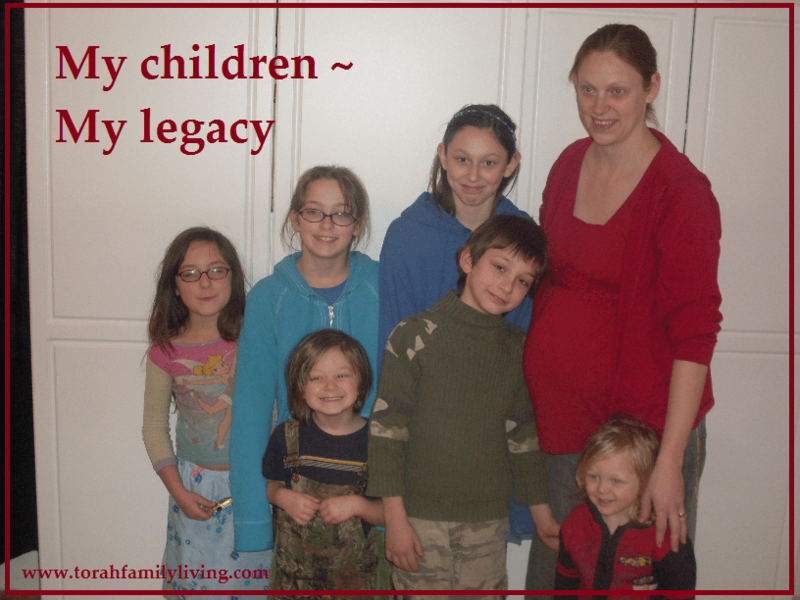 I pray that every single one of my children follow in my footsteps and raise a family of their own. That’s a legacy. No one will care who built that skyscraper that collapses in an earthquake, but people will care that I had children and put my whole life into theirs. They will care that I chose to teach my children about their Creator and how to properly respond to Him and their fellow man. Why does it matter if we choose family life or not? YHVH designed us for family life. When we step outside of that design, we flounder. The world wants to call jobs like laundry and meal prep mediocre and useless, yet they show up for work everyday in clean clothes that someone had to wash. No one denies the comfort of a homecooked meal. Yes, YHVH called us to live ordinary lives filled with laundry and babies and runny noses. But as we embrace and learn to love our calling, we make it beautiful. We make it extraordinary. We give ourselves and our children a place called home. The world wants it so bad they can taste it, but they refuse to embrace their calling, so “home” remains ever elusive. They cannot have it so they put down those who dare to achieve it. They glorify their accomplishments in hopes that someone will care, but at the end of the day, they go to their house and do their laundry and eat their meal alone. They rejected YHVH’s ways and design and are paying the price for it. We know that YHVH has blessed families. We know that He designed each life to be nurtured and trained and guided in the midst of a home. We know that the most wonderful thing in life is to be needed and wanted. We cherish the love that our husband and children give us and lavish our heart and soul on them. We delight in being graced with hugs and kisses from our little ones. We know that no matter what life brings our way, we are doing what we were designed to do. We are giving lives. We are building lives. We will be remembered alongside every other woman who was faithful to her calling. We are mothers, and upon us the nations are built. Now that’s an accomplishment!